From 1927 to 1931, the Cardinals had outfielder Chick Hafey in which he hit .338 and had power to all fields and home run power. He wasn’t a Lou Gehrig or a Babe Ruth but he was among some of the really good players of baseball. He was likened to Rogers Hornsby, Al Simmons, Jimmie Foxx, Hack Wilson and Mel Ott when it came to OPS and OPS+. One of the main differences between Hafey and the others was that he had trouble staying healthy. He had sinus problems in 1926 and had surgery. Many felt this affected the vision in his left eye. He became the first baseball star to wear eyeglasses on the field. 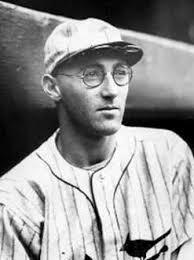 Specs Toporcer was the first baseball player to wear glasses, Hafey was the most prominent; he is one of two Hall of Famers with eyeglasses, Because his vision became so variable, Hafey was obliged to rotate among three different pairs of glasses. Things continued and he had one injury or ailment after another from 1927 to 1931. He never played a full season in those years. Despite missing time, he was a good player that put up a 4.2 WAR for those seasons and he hit .349. He played on three pennant winning teams for the Cardinals. He decided to hold out for more money in 1932. GM Branch Rickey didn’t want to pay him what he wanted so he traded Hafey to the Reds for two players and cash. The two players the Cardinals got didn’t do very well and each one was sold back to Cincinnati. So the deal essentially amounted to Hafey for . . . cash. In the early years, Rickey was happy with Hafey as he was one of the early success stories from the new farm system Branch Rickey was so proud about. Specs Toporcer was the first baseball player to wear glasses, Hafey was the most prominent; he is one of two Hall of Famers with eyeglasses, Because his vision became so variable, Hafey was obliged to rotate among three different pairs of glasses. In the field, Hafey was known for having a “rifle arm.” He had a power peak, averaging 27 home runs and 114 RBI from 1928 to 1930. In July 1929, Hafey tied a National League record with ten hits in ten consecutive at-bats. In August 1930, he hit for the cycle. In 1931, Hafey won one of the closest races for a batting title in history, hitting .349 to beat New York’s Bill Terry by just .0002, and teammate Jim Bottomley by .0007. The title was only secured by a hit in Hafey’s final at-bat of the season. Hafey was fifth in the voting for the 1931 MVP award. When Hafey’s Cardinals faced Al Simmons’ Athletics in the 1931 World Series, it marked just the second time that two reigning batting champions had opposed one another in the Fall Classic. Hafey was part of two World Series championship teams (in 1926 and 1931) as a Cardinal and also made history with the first hit in an All-Star game, starting in left field and batting cleanup for the National League in the 1933 game. He was selected by the Veterans Committee for the Baseball Hall of Fame in 1971. In 2014, the Cardinals inducted him into their team hall of fame.